Dining in Chicago, you can have the best of both worlds in terms of quality and price. If you want a three-star Michelin tasting experience, you have options; if you realized that the fancy dinner your significant other deserves might be out of your price range (even though they probably deserve a fancy dinner for whatever you screwed up), you still have options. In Chicago, the idea of a “good value” when it comes to eating out is a lot more relevant than it is in other big cities. We pay high taxes, our rent is going up, and because most of us are just nice, practical Midwestern people, we want to make sure that if we are going to fork over a lot of money for a sit-down meal -- that it will be worth the splurge. 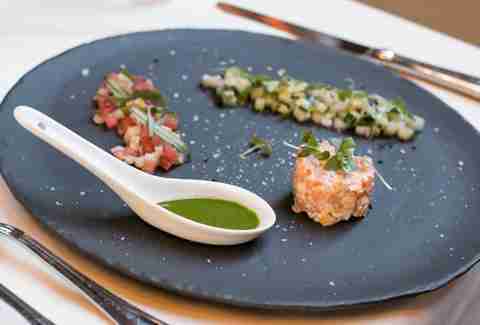 So for those like-minded individuals, we present to you the best-value tasting menus in Chicago. These are full-on tasting menu experiences that won’t completely break the bank, but still offer genuinely memorable meals. Roister was one of the summer’s most anticipated openings, and it has definitely lived up to its hype. The collaboration between Chef Grant Achatz’ Alinea Group and Chef Andrew Brochu has brought through one of the most playful and affordable tasting menus in the city. Clocking in at $85 (plus tax and automatic 20% gratuity), this meal can accommodate parties up to six. Those who book Roister’s tasting menu dine in the restaurants’ prep kitchen while chefs work around the dinner -- which for many diners is an experience of its own. The casual eatery’s menu features simple, rustic dishes that cover classically refined comfort food. 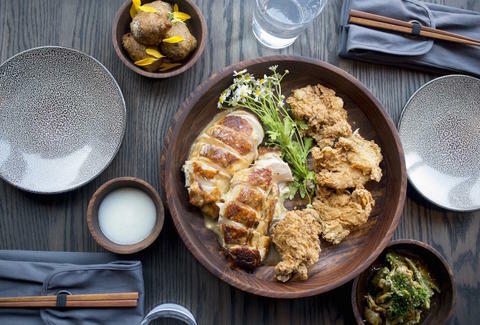 Served family style, the tasting menu features condensed versions of the restaurant’s signature dishes including Yukon potatoes, crab toast, Wagyu beef, and the restaurant's star, the chamomile fried chicken to the signature foie gras candy bar. Dishes can be expertly paired with beer, wine, or cocktails with the help of the servers. Roister’s atmosphere isn’t as refined as Alinea or Next (which is kind of the point), hence the diner-curated hodgepodge of music, but it’s the perfect place to shake things up on a bit on Fulton Market, especially when it comes to curating a low-cost menu in a neighborhood known for their high-priced tasting menus. Elizabeth is one of the most well-thought up concepts to come to Chicago’s tasting menu lineup. The farm-to-table cuisine is that of self-taught chef, Iliana Regan whose reputation is backed-up by two James Beard nominations and a Food & Wine Magazine’s “Best New Chef” award in 2016. The whimsical concept is based around Regan’s upbringing as a small-town Midwestern farmer’s daughter. At $65-$165 (plus tax and included gratuity), depending on the menu, this 10(ish)-course experience can be affordable -- providing that you go during off-peak hours. The reservations are based on a ticketing system that features various prices depending on the night and time that you go. Weekends are on the higher price point, whereas weeknights go the cheapest. Elizabeth also releases last-minute sale tickets on certain nights when service isn’t sold out. Tickets can be purchased with an optional wine pairing (about $100). Diners can also choose a la carte drinks from Elizabeth’s small, but thorough drink list. The menus are playful and based on engaging themes like Game of Thrones, “Ugly Fruit,” “Harvest Moon,” and Downton Abbey. If you are diligent enough to choose to conquer the ticketing system, this tasting menu is every bit worth it. 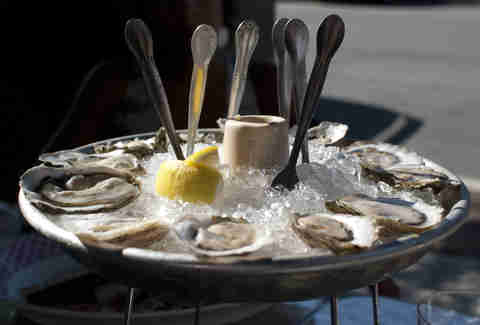 Be sure to check out their pre-fixe dinners that start around $45 per person (plus tax and gratuity). In its own right, The Publican is an institution, Paul Kahan has put more than 18 years into building an empire and is easily recognized as one of the city’s most revered chefs of his time. Clocking in at $65 per person, The Publican’s pork and seafood-heavy tasting menu is one of the best values by a landslide. Noted on the menu as “let the kitchen decide,” the diner gives up all control for a lineup of five to seven courses. Portions are ‘don’t-eat-for-a-week-before’ large and filling, while being strong of flavor and upholding all that makes The Publican a go-to for locals and tourists alike. The menu can include anything from barbecue carrots with a creamy herb dressing to rock cod with leeks and corn to pig brains with salsa verde and blackberry. Needless to say, this isn’t going to be a vegetarian's dream meal. Ask the server to recommend a good beer pairing and split a few beers over each course. Although the food is refined, the atmosphere is casual, and the service is friendly while professional, which makes it enjoyable and affordable. From power players Billy Dec and Kevin Hickey, the duo behind Bottlefork, comes Bib Gourmand-winner The Duck Inn. Based upon its Bridgeport location on Loomis by the Chicago River, the restaurant toes the line somewhere between neighborhood hangout to being many of Chicagoland’s food-forward residents’ “best kept secret.” The menu pays a great amount of homage to the duck, from more casual dishes like a Chicago-style Duck Dog and cheese curds to their signature Rotisserie Duck. The Chef’s Tasting menu is a short four-courses that is a chef’s composition of items off the seasonal menu and even with just four plates presented, diners will not leave hungry. The tasting menu runs $58 per person with an optional wine pairing ($24) and beer pairing ($16). Craft cocktails are also available off the drink list. The four courses are a vignette of dishes like salmon tartare with fingerling potatoes and chive and maybe a signature crispy chicken thigh, cheese curds, or pork shoulder. The cozy atmosphere serves as a low-key place to unwind and eat well. 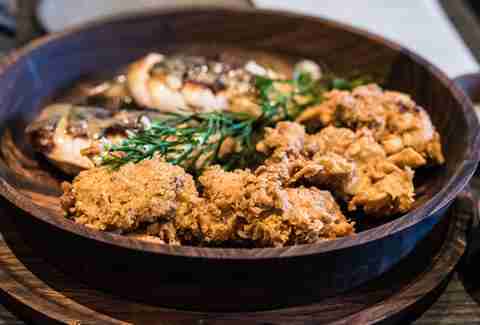 TWO describes its vibe as Midwest seasonal farm-to-fork cuisine, as the food and its presentation are focused around medium plates. The tasting menu at TWO is one of the least expensive tasting menus in Chicago, if not the country. 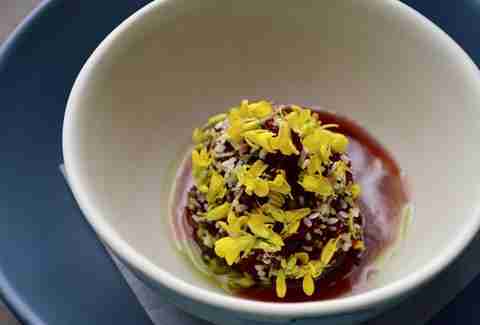 At $45 per person, the eight to 10 course meal brings together items that feature grains and vegetables with a combination of meat. There is also a tasting menu at $50 that is a more meat-focused version. All dishes are chosen by the chef and include a showcase of some of TWO's best menu items. Both menus feature stand-out dishes that change with the season -- dishes like mussels, duck fat croquettes, risotto cauliflower, and Berkshire pork. At first view the food might seem simple, but its comfort focus highlights ingredients sourced from local farms. Although the tasting menu is geared for larger parties, any guest can enjoy the tasting menu and ask the bartender for an on-the-spot cocktail pairing to round-out the kitchen’s dinner picks. This Michelin Bib Gourmand-winning restaurant is intimate, with just 40-seats and a chic ambiance. It’s the sort of place where one can expect to find a good amount of first-dates, and ‘catching-up’ dinners between old friends. Although many choose to order a la carte and share things off the menu, one of the best options for those wanting to go the tasting menu route is the $65, 10-15 course tasting menu. The menu will be selected by the chef, and include many of the staple dishes on the menu. 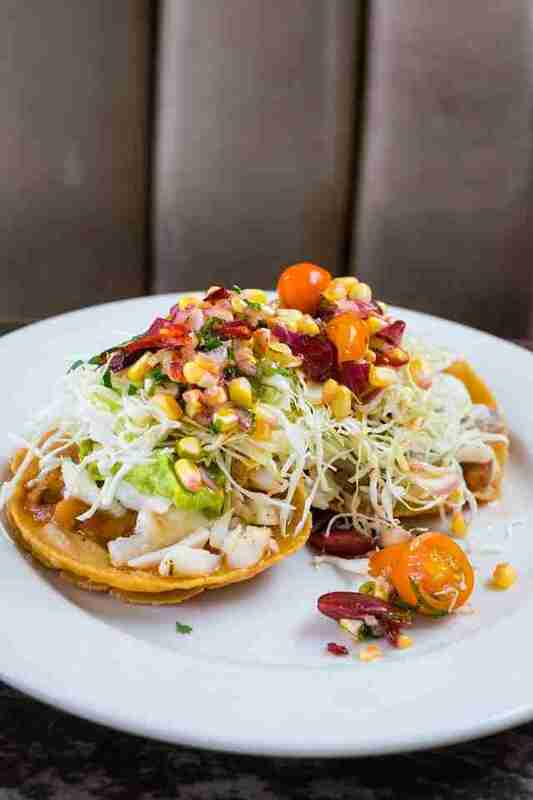 The plates are arranged to flow and highlight the rich flavors, unusual textures, and well-balanced dishes. The menu is Korean-American and a fusion of husband-and-wife duo Johnny Clark and Beverly Kim. The high’s of this menu include the famous Bing-Bing bread and an array of dishes like lamb loin with fermented black bean and a black sesame tea cake with cheese frosting and elderflower. It’s also the type of place will have you consider trying a snap pea granita. Best to order drinks off the cocktail menu. Reservations can be hard to come by and can have a two week wait, but with a $65 price point, it’s definitely worth the wait. Hidden on a little waterway in Lincoln Park, North Pond has been viewed as a superior restaurant since 1998 when restaurateur Richard Mott and architect Nancy Warren renovated the 1912 structure into the sort of restaurant that captures a certain romance for fine dining. Over the years, it’s been a spot mostly regarded for engagements, birthdays, anniversaries -- special occasions. The type of restaurant with menus that at places like Grace and Alinea will cost almost a month's rent. At $95, North Pond’s five-course tasting menu is a splurge on the side of fine dining, while keeping it a little more modest. North Pond offers an optional wine pairing at $45 and also a short, but perfectly executed cocktail list. The five dishes Chef Bruce Sherman features on his tasting menu are all smart, complex, and stunning. Where many menus are throwing together a mix of current menu items North Pond works hard to produce gorgeous and tastefully balanced dishes and courses that are completely cohesive and give diners an original experience. You might find grilled Pacific tuna with charred globe resting on a place with Fairy Tale Eggplants with a rainbow chard strudel or a sweet corn steamed baby chicken with charred kernels, green beans, cucumber, stone fruit, and a Vidalia ring. It’s a darling spot, and its location allows you and your date to take a walk after dinner. The Boka Group and Stephanie Izard’s Girl and the Goat is an institution when it comes to Randolph St dining. 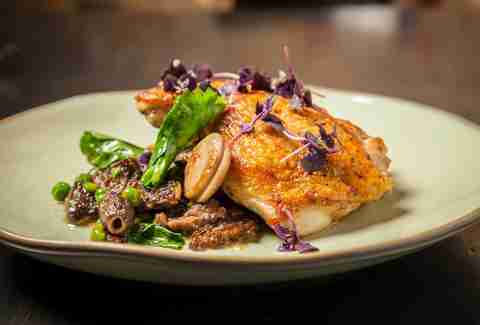 This year, Duck Duck Goat opened, making it one of the hardest reservations to get in town. But between the classic and the newbie is Izard’s most modest and approachable property, Little Goat. The upscale, re-invented diner has also became a staple in its own right on Randolph St, with its solid, locally sourced menu, bread program, morning pastries, and quick grab-and-go options. 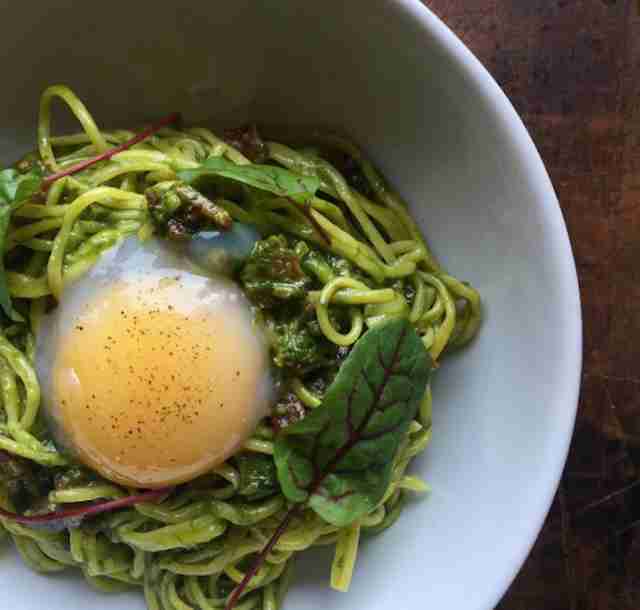 Although not their main selling point, Little Goat offers a fresh, fun, and creative chef's tasting menu. At $100 per person, the six-course meal features dishes like crab & cheese dip, fried pickles, and hummus and goat pate, to roasted pork shank and naan, chi sauce, and cucumber yogurt. An added bonus is sitting in the kitchen where diners get to watch the food being composed. It’s astonishing to think that MK is about 18 years old. Michael and Lisa Kornick along with Chef Erick Williams opened up their restaurant in a time when Chicago was first getting its acclaim as a foodie city and has managed to last the changing times. Williams has helmed the kitchen since 2008, although he was part of the team. The continuity of the dishes have paved a long road for MK restaurant. Featuring New American cuisine and a light cocktail menu, MK has a menu that is a hybrid of French and Italian cooking. The a la carte menu is a stand-alone mixture of dishes inspired by what is looking good at the farmers markets. The dishes show an eye for detail. A dish that features Klug Farm’s asparagus young fava beans, manila clams fennel-scented shellfish broth that is perfectly paired with a 2013 Pinot Blanc. The five-course tasting menu runs $84 ($149 with wine pairings, plus tax and gratuity), which makes it a modest splurge. One of Chicago’s most known Thai restaurants in Arun’s Thai. 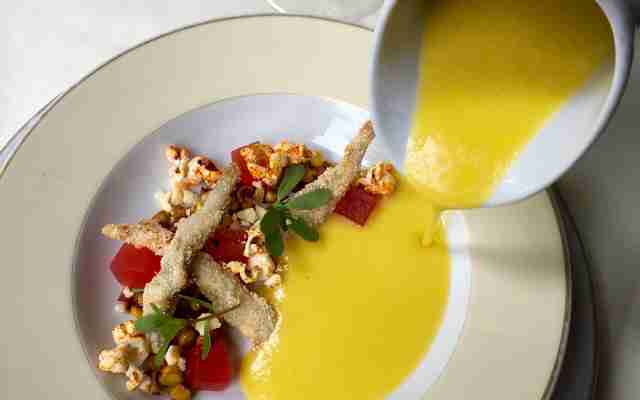 For more than 30 years, Arun’s has been clashing east and west with his tasting menus. The menu is always changing, but always sticks to a cuisine that features a fine-dining approach on Southwest Asian fare. Diners have no choice but to partake in a tasting menu of either 10 or 12 courses, there are no a la carte options. The 10-course menu is priced at $85 with the 12-course at $100, and there are no wine pairings, though Arun has a full bar. Although the vibe is a little bit old-school, the restaurant still tends to fill up on the weekends. In addition to authentic cuisine, those who love Thai food will be happy with classic items like panang beef curry, steamed rice dumplings, and a spring roll that has a hint of a crab rangoon. Arun’s may lack in refinement, but it’s cozy and is highly regarded as serving some of the best Thai food in the city. Carol Hilker is a food writer and former pastry chef based in Chicago. She is also the author of six cookbooks. She's also cheap -- which is why she wrote this piece.